Indian Summer: The colder it gets, the more my mind drifts towards Indian Summer in Monterey, California. Ya see, Indian Summer's the only warm place in Monterey... a city that never gets warm [link]. I'll grant Monterey one thing, it doesn't get "freezing" either... but what they call warm is what an equatorial creature such as myself calls "cold". That all gets thrown out the window at Indian Summer. Indian Summer is part restaurant, part bar, part club and part hookah den. What really sets them apart are the two brick fireplaces that they light every evening. In tandem with their warmers, these turn the patio into a natural gathering place for others who love warmth. People gather around the fireplaces... and conversation naturally follows around the tables surrounding the fireplaces. In a single evening, you can talk with soldiers from the base up the hill, with fishermen and with locals who are winding down in the relaxing warmth. This multifaceted nature is the very definition of a speakeasy. On one of our trips to Indian Summer, we left midday and they offered to save our table when they heard we were planning on returning. The fresh naan they bake is amazing, as is the Indian fare they cook up. I have to add that their hookahs make for the best shisha experience in all of Cali... at least as far as I've found. I'm willing to explore. The only suggestion I have for other travelers is to call ahead, as their hours and the crowds are always "up to chaos". 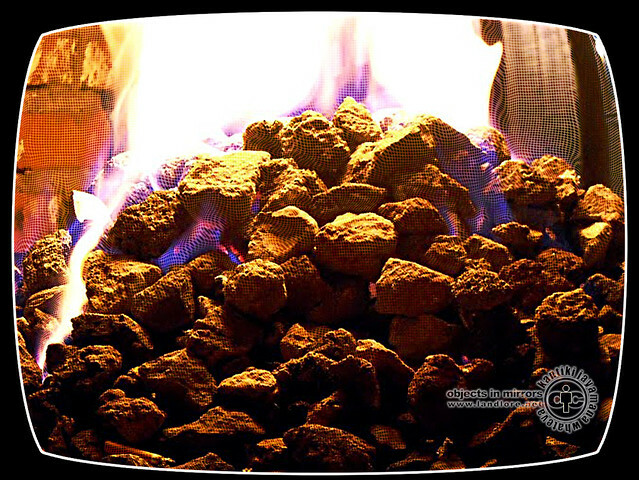 About the Above Photo: The leading photo was taken at Indian Summer, capturing a closeup of one of the two Indian Summer firepits. Since then, it's been used in multiple places, most notably for the album cover for "The Ash of a Thousand Suns". Google didn't select it for Google Maps, but you can see the original [Here on Panoramio]. Also, for a step back in time, you can see the original mod I made from this photo [Here on deviantART]. ~ Matsuo Basho, "The Rustic Gate"
The Guardian recently ran a photolog article [link] covering the ruins of Detroit--the City with a Hollow Heart. The automobile industry's boom was almost a century ago. Since then, it's history has been a record of loss and catastrophe. I've slept in empty factories and migrated with camps of other bums from one ruin to the next, so many of these are near to my heart. Old Slumpy: That photo above is "Old Slumpy". I like to call it "The One that Got Away"... because it got away. I'd heard about it, but never got to see it... not before it was demolished in '07. The William Livingston House was designed by Albert Kahn when he was 23 (back in 1893). There's a picture of it in a much better state (as well as history) here on Flickr. Ruins are the visible symbols and landmarks of our societies and their changes, small pieces of history in suspension. The state of ruin is essentially a temporary situation that happens at some point, the volatile result of change of era and the fall of empires. This fragility, the time elapsed but even so running fast, lead us to watch them one very last time: being dismayed, or admire, making us wondering about the permanence of things. A Call to the Grave: I have a strange attraction to ruins, especially ghost towns. There are plenty of others who share the same attraction, so I'm far from alone in this. The contrast between living, modern civilization and decay really sets Detroit apart from other cities. Imagine walking down a busy New York sidewalk and passing a dead, decaying body on the street... and another skeletal remain just a ways down. It's eerie. These are the ghosts that hang over and throughout the city of Detroit. They quite literally haunt the place. A body is a much easier thing to bury than a building is. 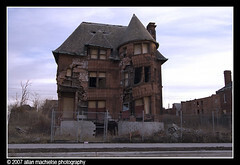 The Streets of Detroit: In my experience, Chicago and New York have nothin' on Detroit when it comes to gangs. Most of the bums have formed gangs, and the colors you're wearing really mean something when on the street. The gestapo police force doesn't follow its own laws, so I count 'em in with the rest 'o the gangs. A tramp called Recon taught me how to guard my backpack and how to spot one gang member from another. The ruins fall under "territory", meaning one gang or another holds claim on them. The ones that are fair game to crash at are usually the ones that are toxic. Asbestos & Company: Tramps are great sources of information for any new hiker who's just landed in the city. Whether that information's reliable is another question. I haven't seen a lot of the buildings that are shown in the Guardian's article, as many of them were on the black list... 'cuz they'd kill ya. Tramps pass on lists of what buildings are asbestos hazards and which ones are not. As the auto-industry used asbestos in their buildings AND their break pads, that pretty much counted out most of the old car factories... but that didn't stop Detroit from demolishing those buildings without taking any precautions to safeguard the population from asbestos poisoning [link]. With all the demos, I expect to find a much different city than the Detroit I last saw in '06. Trip, Hip, Hop 'n Fade Away: The Motor City has one big thing still going for it... a long lineage of artists that broke new ground in music. Motown Records and Marvin Gaye inspire people everywhere to this very day. Hip-hop artists the likes of The Supremes, Aretha Franklin, Eminem and Aaliyah all claim Detroit as their hometown. In electronic, there is an entire genre that grew up and out of Detroit--Detroit Techno. Detroit Nocturnes: The producer Phylum Sinter heralds from the city of Detroit. 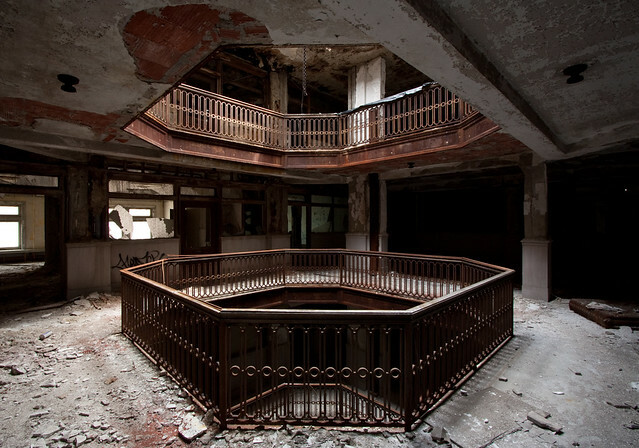 His last album, "Detroit Nocturnes", features the ruins of Detroit Grand Central on the album cover. The sound itself carries the dark, gritty textures of the city and echoes its haunted spirit in each track. The song "Before the Sun Blinds Us", with vocalist Tamara Finlay, holds a special place for anyone with a nocturnal spirit. It's easily the shining star of the album. Enjoy! [Update - 2011.01.22] Detroit really is cursed. In this post alone, the first song of the day was removed from YouTube by Sony... then, Justin Harris--the photographer behind the last photo [link]--moved it to private. Things kept falling apart as I fixed them. In a way, this really does sum up everything about The City with a Hollow Heart. On a brighter side, I was informed that Phylum Sinter is giving away the second song of the day from this post, so I've updated the link to his blog on Tumblr. I guess a light still shines in the dark depths of Detroit.